When you combine the ease of casting with Pflueger Quality you get an underspin reel that"s just fun to use. Don"t be fooled by the price, these reels contain the highest quality components such as stainless steel cone and rear cover, titanium line guide, dual pick-up pins for instant retrieves and 4 smooth ball bearings. All are convertible right-or-left-hand retrieve and are filled with premium fishing line. "I wanted to give it 5 stars, but...... I purchased 2 of these reels and on the first trip out, the pin that holds the spool to the drive shaft came off and stuck in the drive gears. Back to Bass Pro with it. The other one, however, has done great. And with a couple drops of Abu oil it just keeps getting smoother. It has served its purpose well on a long pole for crappie." 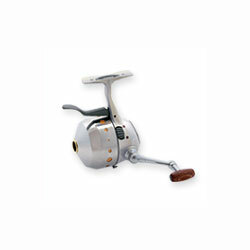 "I absolutely love the Pflueger series of reels and that"s why I have to be slightly dissappointed with this one. Although it is a nice reel for the money it just doesn"t live up to the Pflueger name. Retrieve is smooth and powerful but the casting distance really lacks. Don"t get it wet or it will slip. For the kid transitioning from a Zebco to a spinning it should make it easier. It will however pull in some lunkers." "I fish at least twice a week during spring, summer and fall, mostly with spining lures. I used this reel for only one season. Casts very well and handled fish well. Caught several niced sized spotted bass but the nylon line retrievers are already worn out and need replacing, line slips from pins. Drag sytem worked well and was tested many times, may have been reason reel wore out. I will purchase another one, but recommend Pflueger to repalce the two nylon arm pin mechanisms with maybe stainless steel."